RIPLEY, Miss.—Elite Elastomers Inc., a rubber compounder founded in 2001 in Ripley, has purchased custom mixer Wayne County Rubber Inc. in a deal that gives Elite the capability to serve larger-volume customers and better service the Midwest. Financial terms of the deal, announced Sept. 17, were not disclosed. Wooster, Ohio-based Wayne County Rubber has annual capacity to mix 30 million to 35 million pounds of rubber annually, though it also has equipment available that could nearly double that capability, according to Elite Elastomers President Steve Glidewell. 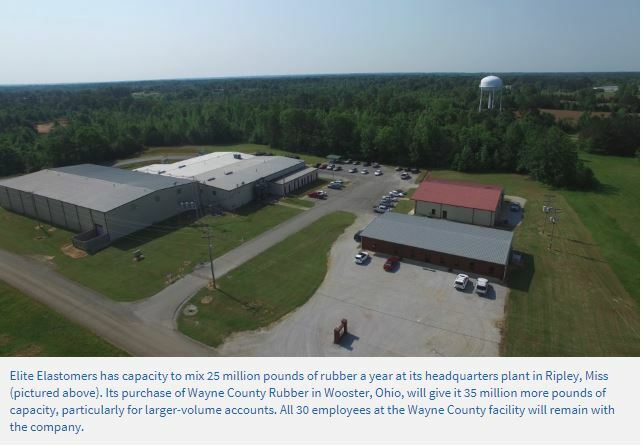 "Our purchase of Wayne County Rubber not only expands our reach geographically, it allows increased production capacity while continuing the tradition of quality compounding and end-use design for both our customers and Wayne County Rubber," said Ginger Glidewell, Steve's wife and technical director at Elite Elastomers. In addition, Elite also entered into a long-term supply contract with Ohio-based Grand River Rubber & Plastics, a relationship Steve Glidewell said helped lead to the Wayne County purchase. Elite Elastomers dubs itself as an "applicative compounder," which it said means it strategically moves beyond traditional custom mixing and emphasizes the best solution for its customers. It has the capacity to mix 25 million pounds of elastomers a year in Ripley. "We consider our core more to be in the technical expertise development end," Steve Glidewell said. "Over the years, we've been more into higher-end, niche type materials." Wayne County Rubber, founded in 1991, is focused on the larger volume applications. "Wayne County brings the larger batch size and more capacity," he said. "And its location in the Midwest is in the center of a lot of activity as far as rubber consumption. It give us a presence there. We're in the mid-South, and our tentacles have primarily been into the Southwest with oil and gas, the mid-South and a little bit in the Southeast." Glidewell said there have been times that Elite has approached customers that were not always centered on one particular kind of consumption of rubber materials, he said. "They may have a wide range of those that are more commercial in nature, or in addition to those that are more higher-end, smaller volume. This way we can offer that full portfolio. That enables us to service a customer with all of their needs." The Wayne County facility will be renamed Elite Elastomers of Ohio. Glidewell said all 30 employees will remain at the Wooster factory, which will be run by Laurie Schang, Wayne County Rubber's current president. "We will also expand the excellent testing and processing capabilities established at our Ripley facility to Ohio, and plan to add five to seven new positions in Ohio," Ginger Glidewell said. "We will continue operating in a culture which utilizes the concept of the improvement footprint for both our facilities and our offerings to unique customers." Steve Glidewell said the employees in Wooster were excited there was an opportunity to continue forward with that facility. "We've been with those people several times over the past three to four months. They are good individuals. We will definitely be keeping them on board as we kind of meld the two facilities together." Initial discussions on the acquisition began in January, and stemmed out of the relationship forged with Grand River Rubber. Elite had been looking at expanding its reach, either through opening a new facility or an acquisition. As officials became acquainted with Grand River, Glidewell said they became aware of Wayne County, which also had done business with Grand River. To his knowledge, the firm hadn't been formally put on the market, but as Elite began the process with Grand River, they initiated the talks. "There's a certain amount of what you feel when you're talking to the people that makes you a little bit more open," he said. "They were a little bit more open to somebody acquiring them after they had enough time to spend with us and get to know us." As for the supply agreement with Grand River, Glidewell said anytime you can have a larger customer willing to commit to purchasing material over a long period of time, "financially that's a wonderful foundation from which to build upon. The people we deal with at Grand River are just wonderful people and integrity-laden, and the type of partners we want to supply in the future." Ginger Glidewell added that Grand River is a customer that "brings value but it also solidifies for us what I would consider an anchor piece of business for the (Wooster) facility in giving us a level of comfort in moving forward with an acquisition of the plant." Grand River President Donny Chaplin said in a statement that the firm's "goal with Elite Elastomers of Ohio is to create an affiliation for the purposes of research and cooperation on formula development and supply while maximizing process efficiency and cost factors." Grand River is known for its capabilities in lathe-cut rubber gaskets, flat belts and pail gaskets.